The last true frontier on Earth is deep in the ocean. Any expedition to the dark depths is incredibly expensive, yet invariably comes back with a host of newly discovered species that are about as alien to land dwellers as it’s possible to get on this planet. The Kiwa is a blind, furry crab that resides 5,000 feet below the surface of the ocean. 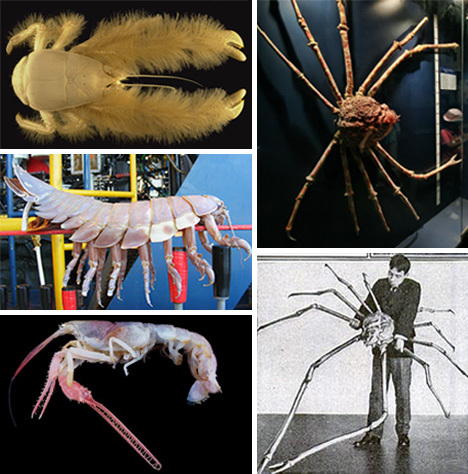 As unusual as it appears, for sheer terror it’s better to take a look at the Japanese Spider Crab, which can grow as long as 12 feet from leg tip to leg tip. 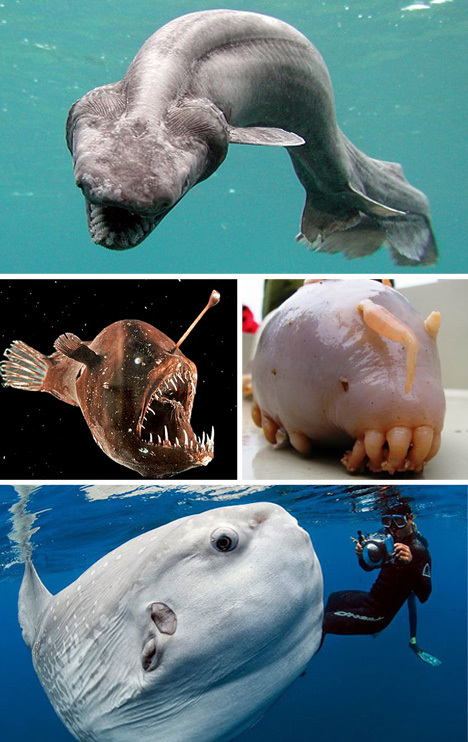 Thankfully these critters roam the ocean floor and don’t get out on the beach much. This blind lobster is a great example of creatures that look similar to those we’re familiar with, but have creepy adaptations to help them survive in the dark depths. 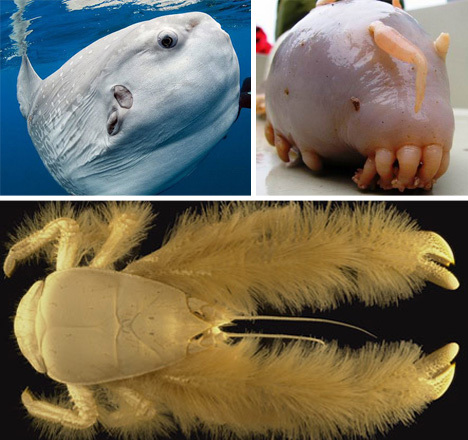 The giant isopod pictured above looks like it could have stepped straight out of a time warp from millions of years ago, yet it is an abundant species on the ocean floor. This marvelous creature looks like a jellyfish, but it’s actually a sea cucumber called the Pink See-through Fantasia. This interesting looking inhabitant of the deep was found nearly 11,100 feet under the surface of the ocean and was only discovered two years ago by a UK diving expedition. 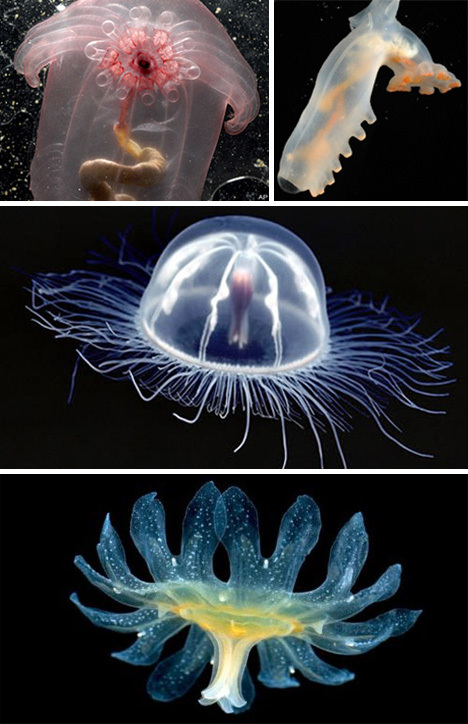 These amazing jellyfish are just two of an incredible variety that inhabit the world’s oceans. They float serenely along with the currents, eating anything that stumbles into their “arms”. This snailfish’s fins look wing-like and majestic, but the only flying it will do is 7,000 feet underwater. 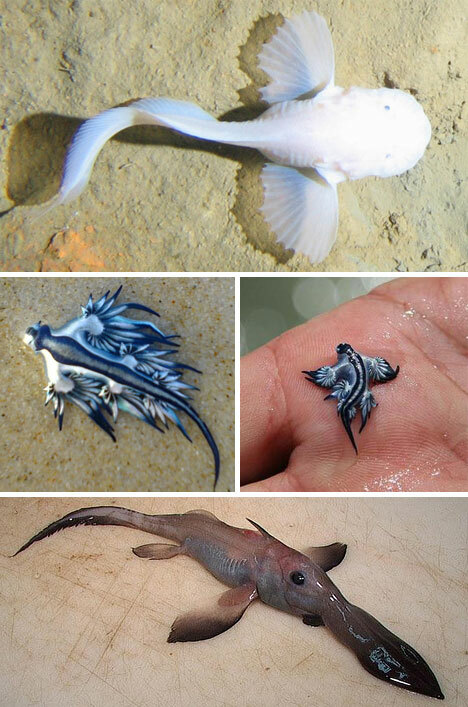 The Glaucus Atlanticus Sea Slug, pictured twice above, is breath-taking, and really really small. It certainly looks cute compared to the Long-Nosed Chimera, which surfs along the ocean floor using its nose to gather up prey in the sand. The Frilled Shark is straight out of a horror movie, and was thought to be extinct until one was found in shallow water in 2011 (the previous sighting had been a dead one, in the 19th century). 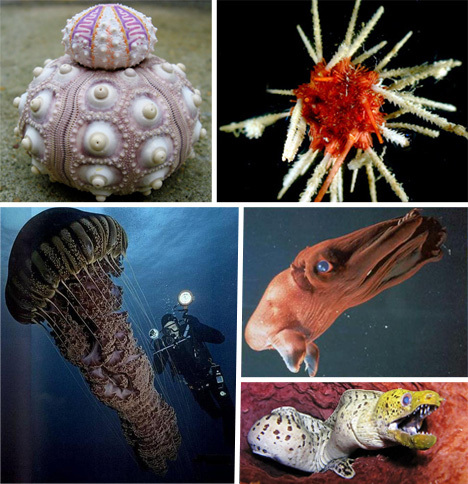 The wild looking Sea Pig is actually a type of sea cucumber. This Ocean Sunfish (known as a Mola Mola) can weigh up to 2,200 pounds. This fearsome looking Anglerfish dangles its bioluminescent light to attract prey towards its gaping jaws. There are over 700 species of sea urchin, and they’re all as fantastic and different as this one, known as “Exquisitus”. The Isopod featured above looks almost like a bundle of sticks covered in ketchup, and is an excellent example of the variety of life on this planet. The Vampire Squid may seem very large in this photo, but it can only reach a maximum of 6 inches in length. This eel looks positively normal compared to most of the creatures found deep under the sea, and its partner in crime, the giant jellyfish from hell.